I love Anchorage in the summer, last post's weather gripes aside. We had fabulous friends over for dinner on Friday (there was an ill-fated clafoutis incident that I won't bother you with here), dinner with a friend of my parents on Saturday, and then walked past a street fair to meet some other friends later that night. On nice days in Anchorage, you run into everyone downtown--forget six degrees of separation, it's more like two. Yesterday David and I went hiking at Falls Creek Trail, which is a very steep uphill trail through trees to a valley at the end. The state's website says the difficulty is "moderate," which may be true if you're a mountain goat or a Dall sheep. My pedometer said that the uphill was the equivalent of going up 141 flights of stairs, if that can be believed, and my legs are a little on the sore side today. By the time we rolled off the mountain dirty and sweaty, I didn't want to do anything too complicated for dinner. 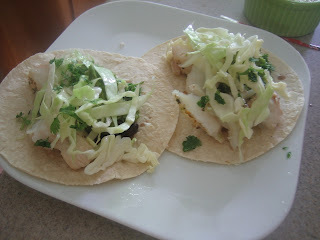 Halibut tacos are one of the great Alaskan summer dishes--you can find them on menus around the state while the halibut is fresh, and while some restaurants are stupid enough to deep-fry halibut chunks for the tacos, this broiled version is much tastier and healthier. I sauteed a small red spring onion and half a jalapeno and mixed them with a can of black beans for a side. Green tomatillo salsa is a perfect complement to the tacos. Pat the fish dry and sprinkle with salt and pepper on both sides. Preheat the broiler or, if it's a nice day, prepare your grill and cook the fish outside. 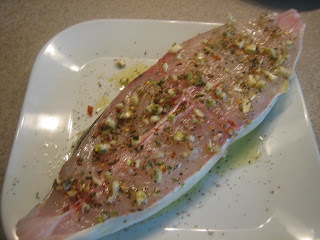 Combine the garlic, peppers and dried oregano in a ramekin, then spread on one side of the fish. Drizzle the fish with olive oil on the same side. If you have time to marinate the fish for an hour or so, cover it and put it in the fridge. You'll want to let it come back up to room temperature before cooking. In a small bowl, toss the shredded cabbage with a little salt, then add the lime juice and toss again. Set it aside while you're cooking the fish. Place the fish on a baking sheet and broil on high for about three minutes on each side. The fish will be done when it flakes into large chunks and is opaque inside. 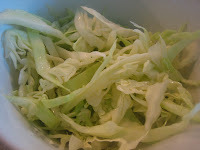 Serve with warmed tortillas and garnish with the shredded cabbage and other fixings. I had to really convince myself not to take a nap! Good for you and David for hiking up a mountain. The only mountain I have to climb is my mountain of laundry. :) I love halibut and this looks like a perfect way to end a healthy day! Don't even make me THINK about my pile of laundry. I'm right there with you. I'm intrigued by that clafoutis incident! In the meantime, it sounds like you had a great hike. That's serious legwork! The short version of the clafoutis story is that it didn't set, even though I followed the recipe. Such a waste of some really gorgeous plums. Hahahaha! Love the title! Yup, I'll take the easy one and then come back for this yummy tacos! Great idea using fish ... I don't believe I've had fish tacos. It's always been some kind of red meat or white. I think I'll like this and much healthier too (not that I'm too bothered about healthy, hehe)! Hope I can find me some halibut but I guess I can always substitute with some other white fish? Ping, any other firm white fish should work just fine--and salmon would be good too. I was thinking of getting cod the next time I made these. I go hiking every Sunday morning, just love being in nature. I agree, you don't want to cook anything complicated after that. This is a lovely healthy recipe. You're a better person than I am--I love in one of the most gorgeous places in the US, but don't hike nearly often enough. Halibut in a taco? I think this should get you in the fish cooking hall of fame. Love, love, love this. What a gorgeous and tasty taco! I love the simple marinade you used for the halibut. 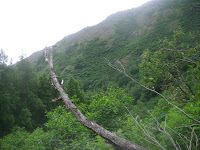 I try and go for a hike whenever I can but with our busy schedule it just doesn't happen as often as we'd like it to be! This really is SO easy--perfect for busy evenings. And your healthy and delicious meal afterwards is a winner! This is my type of lunch! This halibut taco looks really fresh and tasty. Wow, this really looks so tasty! We have some red snapper in the freezer (caught by The Hubs in the Gulf of Mexico) and we are thinking about grilling it. I am going to use this marinade/seasoning for it! Ooh, let me know how it works with the red snapper. I have recently become addicted to hiking. The scenery is fantastic - it barely feels like a workout. Cooking fish at home is a snap, really, especially if you grill it. I can't imagine carrying a child up a mountain, particularly not one of these. I took several years off hiking and am just getting back to it this summer since I'm not training for a marathon. Funny, I always say that there is one degree of separation in Missoula! In some crazy way I sort of like it, because it feels like one bit tight knit community. Love the pics of the hike, so gorgeous! I am not a big fish eater, but my hubby is and he would adore these tacos. Sometimes I surprise him with fish and he's always crazy happy about it! Oh, yeah, broiled is the way to go! I'd love to have fresh halibut available...I bet these tasted incredible! LOL about your hike...141 flights of stairs? Yikes! I adore fish tacos! I've never tried them with halibut and these look perfect! Oh, it looks so pretty there..it's like 113 where I live today. Gimme a fish taco and this view and I'm a happy camper!! Those look absolutely delish. I can only imagine how beautiful Anchorage is right now. ok nice post but... HALIBUT TACOS!!! oh... YO QUIERO!!! That had to have been some hike! The halibut looks sooo good too! What an amazing hike...I'll probably go for seconds and thirds with the halibut tacos after that hike, nice! I definitely had seconds but David had thirds...I swear he has a hollow leg. I prefer the fish broiled rather than fried too! It is way more healthy. Beautiful scenery, i would love to visit this frontier sometime! Alaskan halibut is so good. A friend of my parents brought some home for us a couple of years ago. It was SO good. I can just imagine how delicious it would be in a taco. Your scenery is just gorgeous. Hi Krista, Wouldn't I love to trade even one week with you...me in Anchorage, and you in South Florida...we an swap homes! I would love to go hiking, and you could enjoy yourself right 'smack' on the beach; because that's where I live these days. I swapped my house for our rental apt. to enjoy the ocean! Beautiful scenery and that must been quite an experience climbing the trail. Lovely fish recipe and yes, my other half will drool over it, maybe I need to try with other type of fish. That halibut looks very very good I have to say, and the idea of having it in tacos - fabulous! Sounds like the perfect end to a perfect day. A lovely (if exhausting hike) and fantastic tacos. I love halibut and it is well able for the heat of jalapenos. What a great way to spend the day. 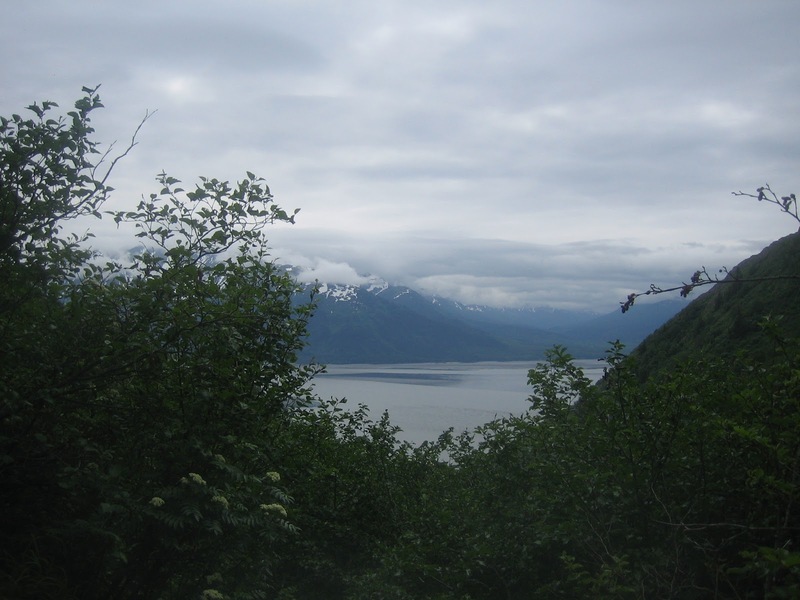 I have to admit it nice reading about being "sweaty" coming down the trail When I think of Alaska, sweaty never comes to mind (smile). You had a great trail walk, then a great healthy meal. Awesome. Just catching up the blog--yikes--several months behind! But you must know that I loved the dessert you declared a disaster. No matter what you say...those plums were magical, especially since they were the first I had had this summer. Private jet charters are still considered a luxury reserved for politicians, sports teams, and celebrities. This is unfortunate because private jet charters can be not only an affordable option, but an economically feasible one. As with any trip, several variables determine the cost and it is important to thoroughly investigate the charter operator and get a few estimate before "signing on the dotted line" to charter.